Palm sanders have been around for a long time and are also called pad or finishing sanders. The better ones oscillate or orbit. The cheaper ones just vibrate. These sanders are best used for finish sanding as they remove stock slowly. These work that these sanders perform are measured in orbits/min. These sanders are an improvement on the better palm sanders and are very versatile. They work by attaching the pad to a bearing and counterweight which is then attached off-center to the drive motor (like the orbital). These sanders do not leave a predictable pattern and work without regard to the grain of the wood. They have holes in the sanding pad to allow dust collection via a bag, canister or shop vac. The sand paper adheres to the pad via an adhesive or Hook and Loop (like Velcro). 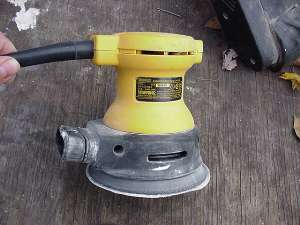 If you have a choice, get a sander that uses hook & loop paper. Newer models have a pad brake that stops the pad when it is not in contact with the work surface. There are also right-angle versions of these sanders. Kings of stock removal. 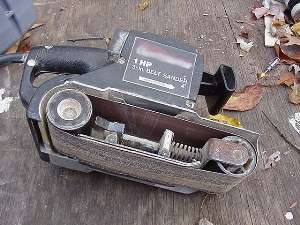 Belt sanders have a drum in front and back that the sandpaper belt runs on like a tank tread. The belt runs over a platen which provides a flat sanding surface. These are versatile machines that can perform jobs from stock removal to touching up floors. Some models also have a knob to control the tracking of the belt from side to side. They usually have a port on the top or side to allow for dust collection. 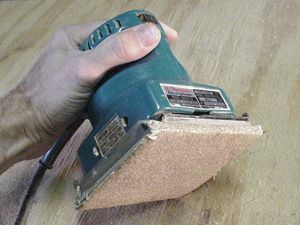 When using these sanders on wood, make sure you work with the grain! 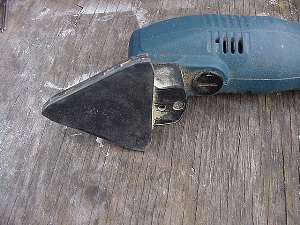 Detail sanders are usually a type of orbital sander that has a smaller (often interchangeable) tip. The cheaper ones just vibrate. They are good for inside corners, moldings and other hard to sand areas. The sand paper usually uses some sort of adhesive to stick to the sanding pad. The more expensive models (sometimes called profile sanders) have interchangeable tips that allow the user to easily sand moldings and other contoured pieces.